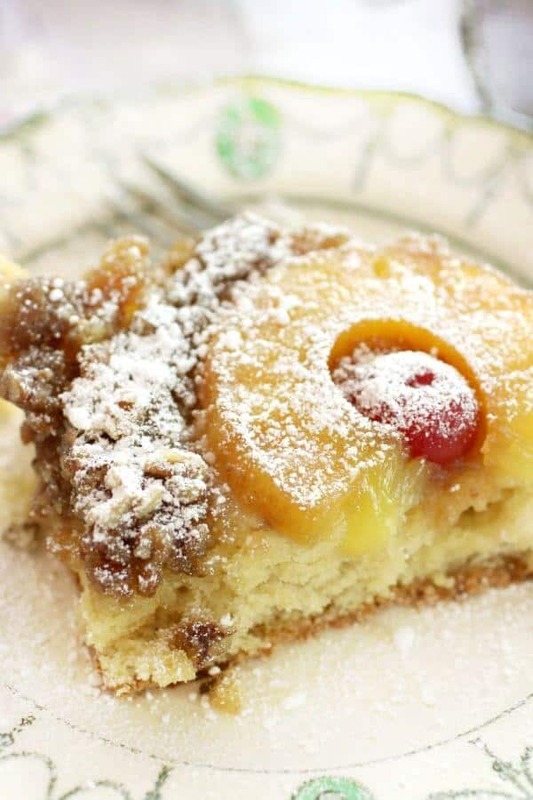 Make this pineapple upside down cake from scratch – just like mom used to make! 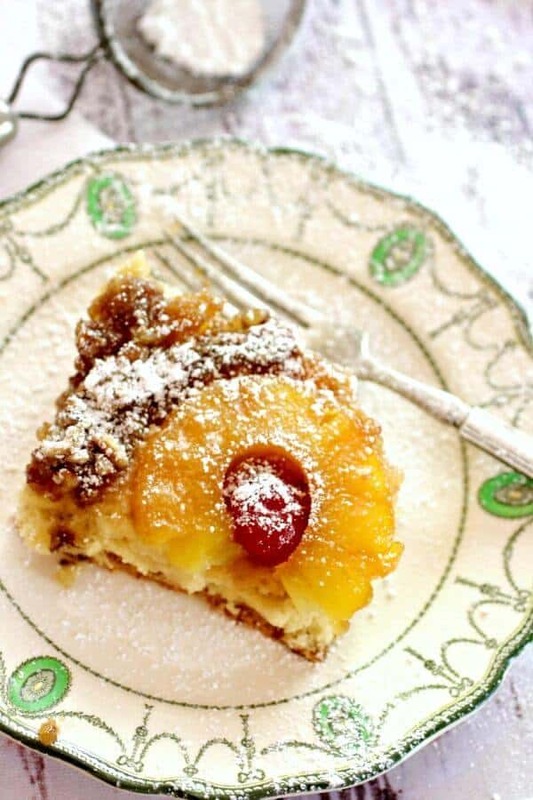 Pineapple upside down cake recipes are iconic classics that come with many variations. The original one is my favorite, there’s just something about a thick, caramel syrup combined with juicy pineapple, and feather light sponge cake that no other recipe can touch. This cake has a delicate pineapple flavor without being overpowering. That keeps this dessert from being too sweet with the buttery brown sugar topping and the pineapple. 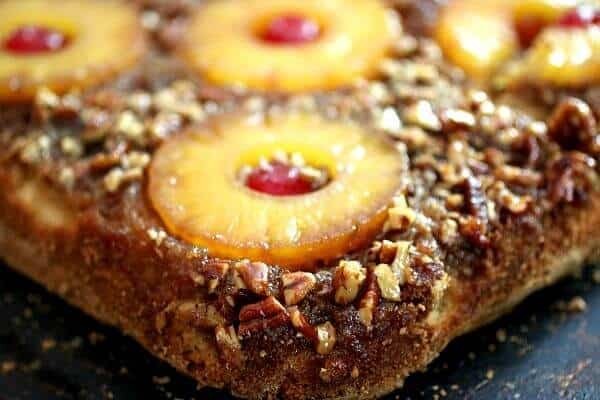 I’ve seen some pineapple upside down cake recipes without pecans but I love the buttery flavor and crunchy texture that pecans give to the fruit and spongecake. Pineapple upside down cake from scratch has a delicate, sponge cake texture. Experience level: Intermediate – experience with whipping egg whites and folding them into a batter is helpful. 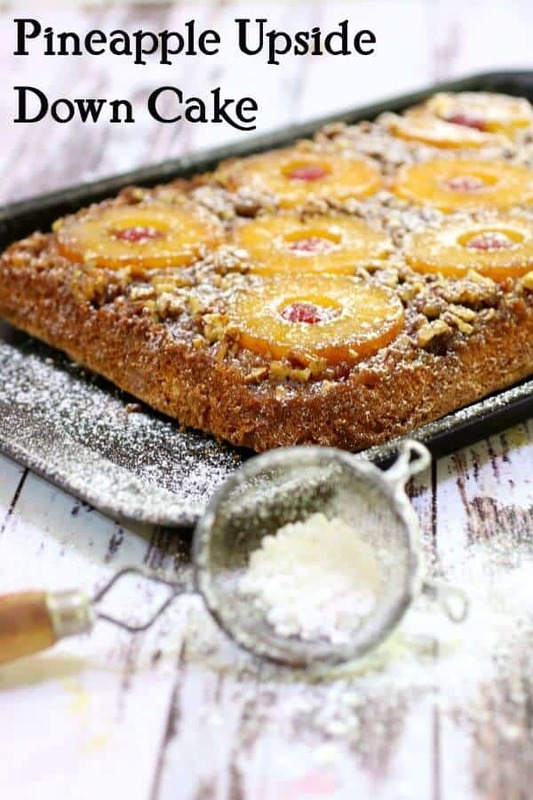 Although pineapple upside down cake is simple there are a few tricks you need to remember that will help you create the perfect cake. Fold the egg whites in very, very gently so they don’t deflate.This keeps your cake light and airy. If you overcook the cake it will taste like stale cardboard. Watch it carefully. Let the cake cool for about 5 minutes before turning out of the pan. The sauce needs to thicken up or it will run all over. Adjust the serving size to 6 so you’ve got the measurements for half this cake. You can do this by clicking on the serving size and adjusting it down. Heat the skillet in the oven with the butter while the oven preheats. 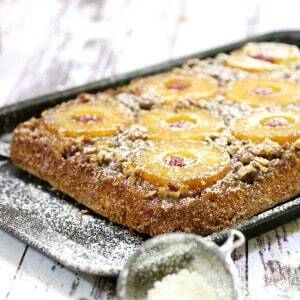 Remove the skillet from the oven and mix in the brown sugar and lay the pineapple, cherries, and pecans just like with the regular cake. Put that back in the oven for 5 minutes or until hot and bubbly. Remove from the oven and spoon the cake batter over the brown sugar mixture. Put into the oven and bake for 30 to 45 minutes, or until a toothpick inserted in the center of the cake comes out clean (be careful not to go to the bottom of the pan with the toothpick). Brown sugar and butter form a gooey caramel around the pineapple and pecans. How do I flip a pineapple upside down cake? This is probably the trickiest part of this entire recipe! Whether you make the cake in a cast iron skillet, a cake pan, or a 13″x9″ pan the process for flipping is the same. Allow the cake to cook for 10 minutes before inverting. While the cake is cooling get a pan that’s bigger than the pan the cake was baked in – you’ll invert your cake onto this. Run a knife around the edge of the cake pan to loosen the cake from the pan. Place the bigger pan over the top of the pineapple upside down cake pan so that the surface is facing the bottom of your cake layer. Carefully flip it over, holding the two dishes firmly together. Give the cake a minute for the topping to slip off the bottom and onto the cake. Gently remove the pan that the cake was baked in. Can you refrigerate pineapple upside down cake? You sure can. It’s best to store any remaining cake in the refrigerator for up to three days. I wouldn’t suggest making this cake ahead of time because it’s best when it’s served warm and freshly baked. How long do you wait to flip a homemade pineapple upside down cake? 5 minutes is just about right – just don’t wait longer than 10 minutes or the cake topping will be too cool and stick to the pan. If this is happening flip the cake back over and slide back into the oven for a few minutes then try again. Let the pineapple upside down cake rest for about 5 minutes after taking it from the oven. Pig Pickin’ Cake – easy yellow cake with pineapple, mandarin orange, and a creamy whipped topping. Strawberry Punch Bowl Cake – in some places you might know this as trifle. Blueberry Cream Cheese Coffee Cake – the classic with the crumble topping. Strawberry Filled Angel Food Cake – super easy because it starts with a purchased angel food cake. Orange Layer Cake – another vintage recipe. Whiskey Sour Bundt Cake – just like the drink, with maraschino cherries throughout. Meyer Lemon Bundt Cake -tangly lemon bundt cake is so easy! This recipe doesn’t call for anything fancy but it works better with a heavier pan. I like this heavy, nonstick pan from OXO. This is the best pineapple upside down cake recipe ever. It comes from a mid 1930s cookbook – I ‘ve adapted the recipe a bit just to make it easier. I hope you enjoy this old fashioned favorite! If you love this recipe please give it 5 stars. 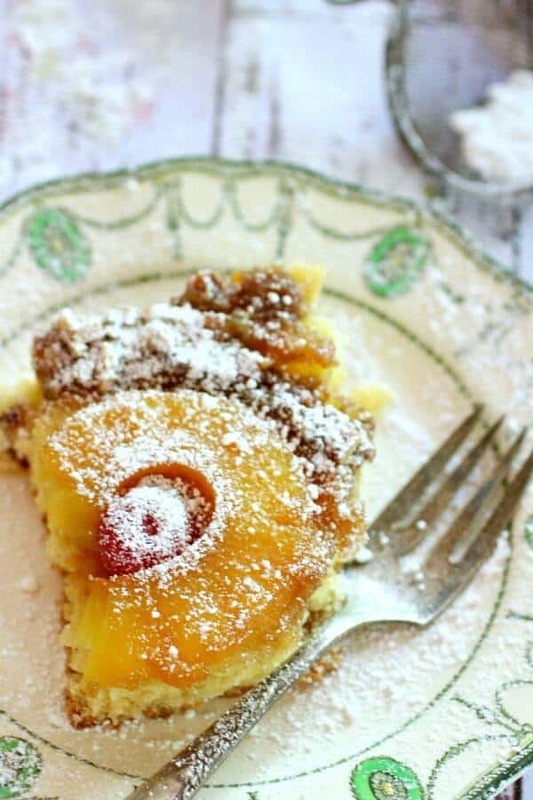 A classic recipe for tender pineapple upside down cake - super easy to make even for the beginner. Mix the melted butter and brown sugar and stir until smooth. Spread an even layer over the bottom of the pan. Lay the pineapple slices in a single layer over the bottom. Put a cherry in the center of each with the cut side up. Whip egg whites and cream of tartar until stiff but not dry. Beat sugar and yolks until thick and lemon yellow. Add in the reserved pineapple juice, flavoring, and rum if using. Sift flour, salt and baking powder together. Blend into the egg yolk mixture until smooth. Make sure the batter is well blended before adding egg whites. Fold in 1/2 the egg whites carefully but thoroughly. Spoon over the pineapple and bake at 350F for 30 minutes. Allow to cool 5 to 10 minutes before inverting on large platter. Submitted to Meal Plan Monday – Be sure to check out all the mouthwatering recipes!